"A quick and satisfying meal of tamales. Serve with sour cream and salsa, if desired." In a large skillet, cook meat, onion and garlic until done. Drain fat. Add tomatoes and creamed corn. Add milk, olives, eggs and cornmeal. Bring to a boil. Pour into a greased 2 quart casserole dish. Bake at 350 degrees F (175 degrees C) for 25 minutes. Put the cheese on top for the last 5 minutes of baking. 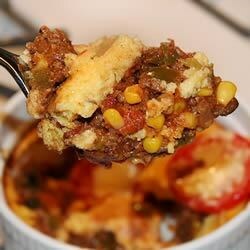 See the simple secret to this 5-star ground beef casserole. I made this recipe but made the corn bread batter and poured it over the top. My family liked it so much I made two pans and both were gone in one sitting. Wow what an awesome meal. Very mushy...the first bite was okay, the second bite made me full. I will not make this again.